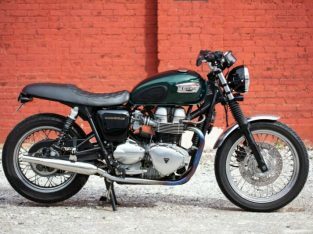 If you’ve been looking for a timeless, classic-styled British custom motorcycle – well look no further! 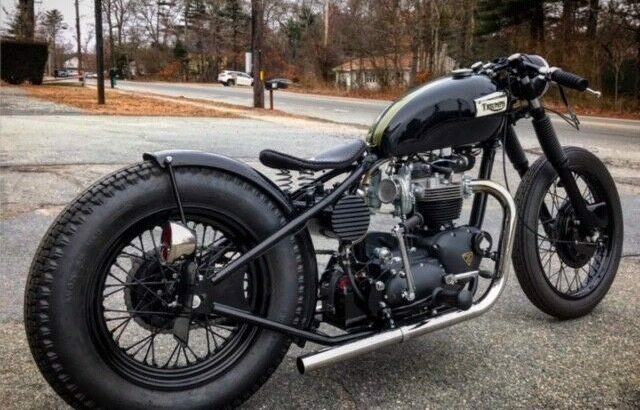 This 1966 Triumph TR6 custom is what you need! 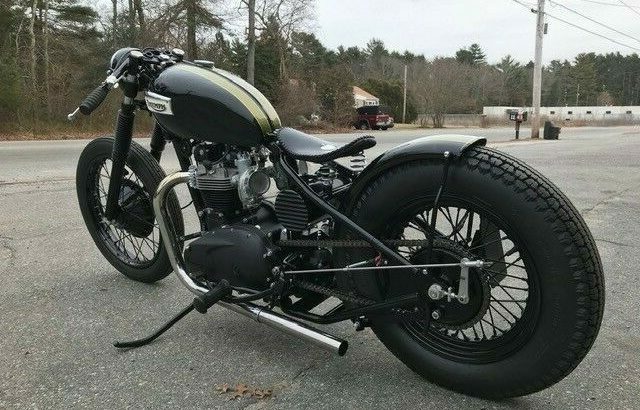 This bike is a perfect blend of form and function – handles well, tears up the back roads, and looks good doing it! 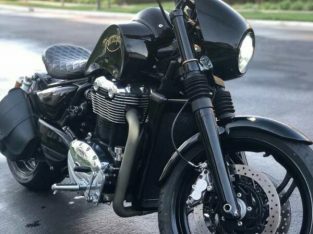 This is a complete, ground-up, professional custom build by Choppahead Kustom Cycles. 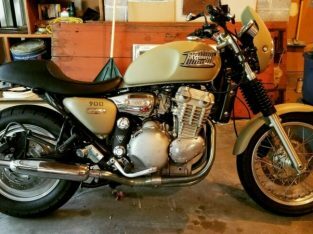 Everything has been gone through on this bike and is either new or rebuilt. 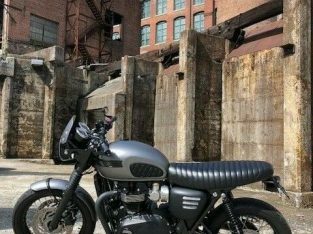 No expense was spared in the building of this bike, and it is backed by over 18 years in the industry building Triumph and American motorcycles (custom and restoration). We’ve always stood behind our work! CHASSIS / FABRICATION:- This is a stock 1966 Triumph TR6 front frame section mated to one of our Choppahead hardtail rear sections (4″ stretch). Oil tank is a Choppahead finned-end aluminum tank. Battery box and Model A taillight/plate bracket are also by Choppahead. Everything on the frame has been tig-welded, and powdercoated black. 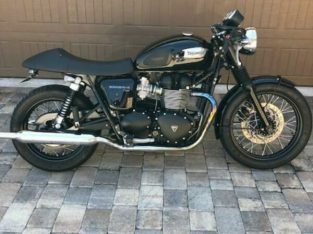 Foot controls are stock Triumph with new foot rubbers. 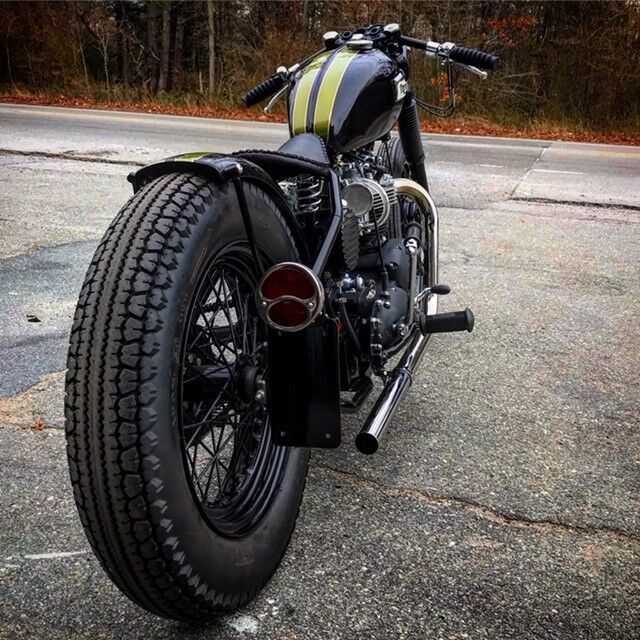 MOTOR:- Motor is a complete top and bottom end rebuild, by Choppahead Kustoms. 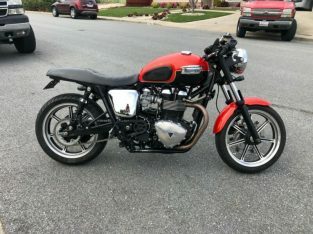 Motor is a 1966 TR6 bottom end with T120R Bonneville head. Everything is new in there (valves, springs, pistons, bearings, seals, clutch, primary/rear chain, gaskets, etc)! Sludge trap is clean. Pistons are +20 over, so there’s plenty of life in the cylinders. Rocker boxes have Choppahead kustom aluminum valve inspection caps. 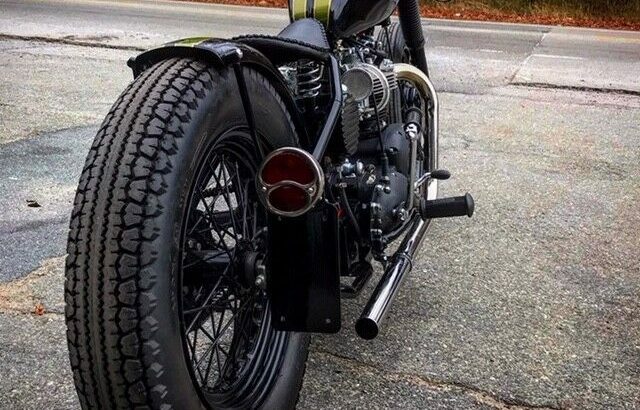 Points cover is a custom Choppahead contrast-cut spade cover Exhaust is a new set of custom 1 3/4 straight pipes. Kicker arm and shift lever are new with new rubbers. Motor mounts are Choppahead super-stock mounts made from chrome moly. Carbs are new Amal 930’s, with new custom velocity stacks. Ignition:- We installed a new Boyer electronic ignition, coils, Podtronics voltage regulator, and new battery. This thing fires easy on first or second kick! All new wiring throughout the bike. New ignition switch. 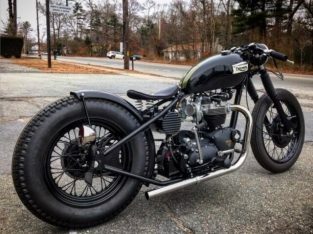 Tins:Gas tank is a stock Triumph slimline tank, rear fender is a new 5.5″ heavy duty custom rounded fender with a bead across the rear. 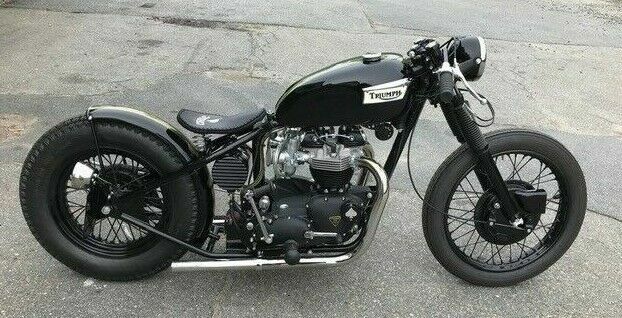 Tins are painted black with Triumph spring-gold race stripes. Hand pinstriped gold outlines by Chainey Customs. Seat:- Seat is a custom bent Choppahead seat pan, covered in hand-tooled leather by Jay Fortin. 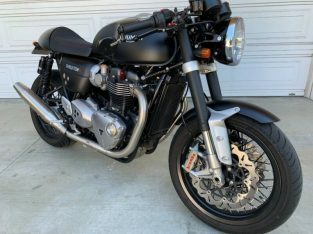 Front end:- Front end is a completely rebuilt early 1970’s Triumph front end, with all new internal bushings, fork seals, fork gaiters, clip on handlebars, control levers, grips, and headlight/headlight ears. The neck bearings are new timken-style sealed bearings and races. Fork lowers and triple trees have been powdercoated black. 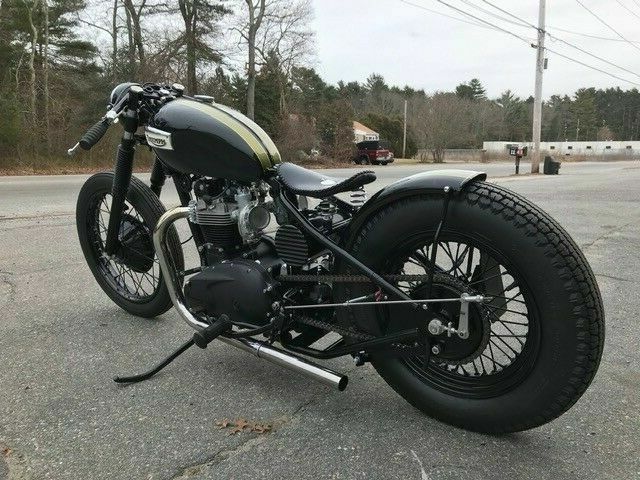 Wheels:Front wheel is a stock 19″ early 1970’s Triumph front wheel. 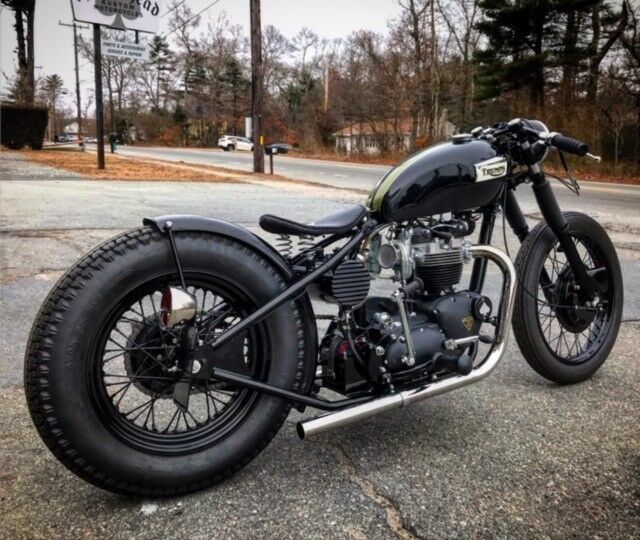 Rear wheel is a stock 1963-1970 Triumph rear hub laced to a 16″ rim. Both wheels have new brakes and bearings, and have been powdercoated black. 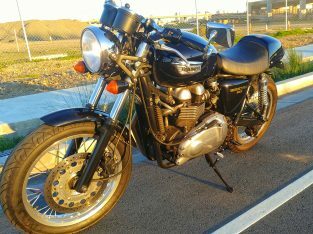 Brand new Avon Speedmaster MK II tires on the front and rear as well. New rear brake rod and brakelight switch as well. Please contact us if you have other questions! $500 deposit due within 24 hours, balance due within 7 days (cash, wire transfer, certified check). We will ship anywhere in the world – at buyers expense. We will deliver locally (within 100 miles) free of charge. 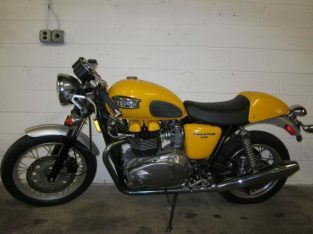 Note – This bike is also for sale locally, and we reserve the right to end this auction at any time! So if you really want it, and want to buy it outright – contact us directly. 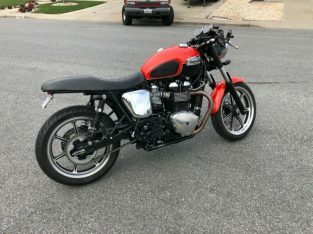 AMAZING CUSTOM CAFE RACER Triumph Thruxton 1200r **LOW MILES!! !